For the adventurers, dare-devils, gastronomes, octane-heads and even the pampered, Thrill Experiences have it covered. There are lots of gifts that are perfect for him and best of all if he wants something else, he can easily swap for another at no cost or upgrade for the price of the difference. You could easily open up a whole world of Thrill Experiences. Whether he's a high flier or a thrill seeker you will find that an aerobatics flight takes his breath away just as much as a drive in a powerful V8 race car. But there are so many more. For exhilarating experiences to share or to enjoy solo, he might like to try tandem skydiving, hot air ballooning, rally driving, helicopter flights and for the car addict, there are drives at the top end of town - Ferrari and Lamborghini cars. The hardest part will be giving back the keys. If you're wanting an experience that's a little less thrilling but thrilling all the same, then guys can saddle up with their gals for an unforgettable horse-riding experience. There are also tours, rock climbing, abseiling and quad biking. Best of all, many of these experiences can be enjoyed together with a loved one, family or friend. Making it a thrill experience for someone you love is so easy. 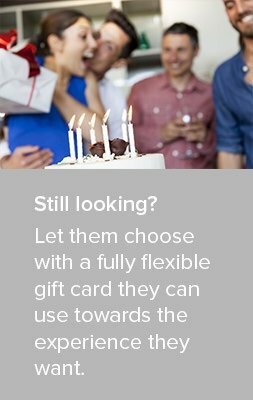 With gift ideas that are so diverse, available right across Australia from Melbourne to Perth to Darwin, Sydney and Brisbane. So, if you or the all-important man you are buying for fancies doing something that's thrilling, adventurous or perhaps something relaxing, then turn to Thrill Experiences for some amazing gift ideas and gifting options. What are the top presents for men? Birthdays, Christmas, Father's Day. Whatever the occasion, if you want to make his day super special, then you can't go wrong by looking at the top gift categories. It's the best selling and has been for some time. Driving a V8 supercar on one of Australia's top race tracks. After a safety briefing and getting suited and booted, he can enjoy the acceleration and braking capabilities of the V8. Our advice, don't hold back. You can reach around 200 kph down the straight. As with most experiences, spectators are welcome at the venue, so you can see him pushing pedal to the metal and having the thrill of his life. For something that will get his gyros spinning, there's nothing like a vertical lift off in a helicopter. Available in most of Australia's cities, you can get a fresh perspective of the CBD, from Sydney Opera House, the Harbour Bridge to the Melbourne MCG. Flights are available as both public and private flights with window views for all. For an adventure that's a little more sedate, but includes a vertical lift off too, try Hot Air Ballooning. It makes for a memorable birthday gift for him and it's also one where you can share in the fun. Sightseers and gourmet enthusiasts will revel in a calm flight in the early hours of the morning. Just as the people below are awaking, take in the serene view of the world from up above then enjoy a champagne gourmet breakfast upon landing. How about classic flying instead? Thrill to the put-put-put of the prop firing up and the whiff of the fuel as it's chocks away for a Tiger Moth flight. This is no ordinary flight. Your guy will be head to toe in the same regalia that men wore during the wars, Biggles style. And if it's Redcliffe, he can enjoy the history that awaits in the pilots waiting room.